This Monday, July 29th, I am pleased to announce that the cast of Finding Bigfoot will be present at a fundraising event for Mike Rugg's Bigfoot Discovery Museum in Felton, CA. 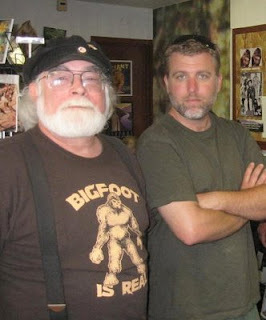 Bobo, Matt, Ranae, and I will be hanging out at a barbecue hosted at the museum from 4 pm until 6 pm to sign autographs, take pictures, or to just talk about bigfoot. The admission is free, but a scrumptious barbecue will be happening for the low price of $5. So if you're anywhere in central California, specifically in the Santa Cruz area, you should drop by and say hello. I hope to see you there! Hey Cliff sorry I can't be there can you tell us how to make a donation? The Free Gig is Happening! Coast to Coast with George Noory, Tonight! Bigfoot Trivia - Where is this?